Good morning, my lovely friends! Today, let's talk about cleanin' your scene. 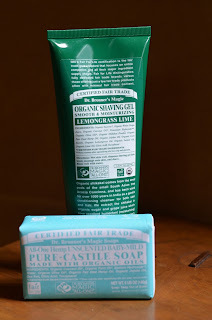 Last week, a lovely rep over at Dr. Bronner's Magic Soaps sent me Organic Lemongrass Lime Shaving Gel and Baby Mild Organic Bar Soap, two of their Organic and Fair Trade products to review. ***Sidenote- aside from the free gel and soap, I received no other incentive for this post. The opinions expressed here are my own. 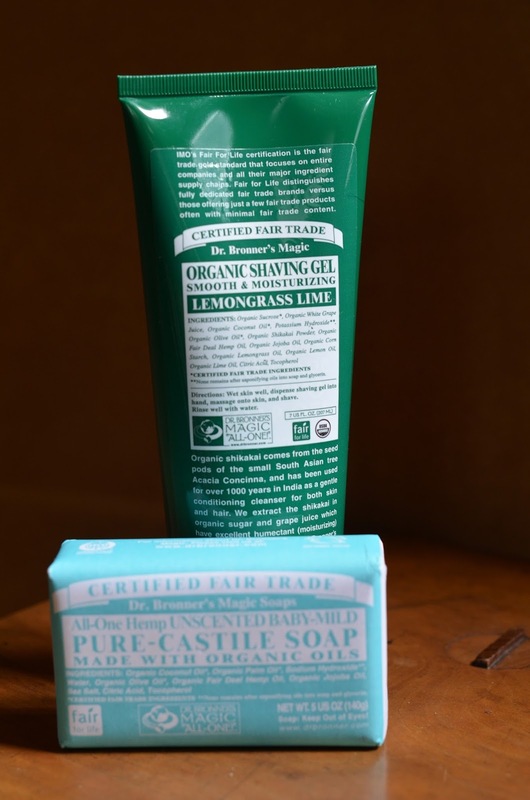 No complaints outta me, since we've been long-time users of their Pure Castile Classic Soap (which we use for EVERYTHING—from cleaning floors to dishes and countertops) and their totally exhilarating Peppermint Bar Soap. And seriously, if you've never tried that peppermint soap on your whole body, lemme tell YOU, you are most definitely missing out. Try it and you will, undoubtedly, know what I mean. ZING! Anyhoooooo, I tried the Organic Lemongrass Lime Shaving Gel, and quickly fell in love. The gel smells incredibly fresh and clean and glides smoothly over the skin. Definitely recommend for a spa-like shaving experience for the ladies. Striving for a fair review, I asked my fella to try the gel on his face. During his shave, he got the gel on his lips and had a bit of an unpleasant experience. Used to traditional shaving foam lather, he also had trouble "seeing" where he had and hadn't shaved and preferred his ol' standby Barbasol foam. I, however, am a convert and have fallen in love this gel and its paraban-free, organic goodness. Having been on the hunt for a funk-free shaving product, I'm sold and will continue to stock up on this gel. The Baby Mild Organic Bar Soap is great as well! After an entire week of regular use, we love the the fact that ALL of the ingredients are organic and Certified Fair Trade, so again, there's nothing icky in there for the kiddos. Told you I'm an obsessive researcher. Check out its stellar EWG (Environmental Working Group) rating on the Skin Deep Cosmetic Database. That's about as safe as it gets, friends! But do read the label and heed the warning to keep this soap away from wee ones' eyes. After an accidental splash, my daughter got some soap in her eye and did experience mild stinging. We've been using this product from the neck down and are sticking to tear-free shampoo and face wash until the girls are a bit older. 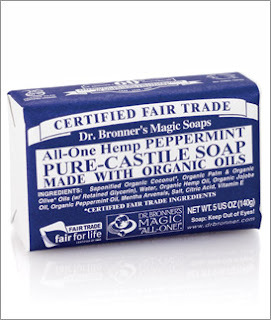 In a nutshell, we've been loving Dr. Bronner's products for many years and are sticking to 'em! They just keep coming up with more organic goodies. Right up our alley! Keep it up, Dr. B! We're so happy to break free from products packed full of toxic chemicals and we fully support your forward thinking moves out there. Cheers to you! What's your favorite line of household soap/cleaning products? Have a squeaky clean day, my friends! I love that peppermint bar soap! Dr B also has it in a liquid form and it's amazing!